Fall in New Hampshire: The air gets crisp, the leaves blaze into color, and the back roads beckon – especially if you are on bicycle. I’ve found three special routes that uncover all the New Hampshire nooks you’ll need for a long-weekend getaway. Covered bridges, apple festivals, back-country wineries, chilled dips in lakes and mountain vistas. It’s open-air roads for two wheels, traffic not included. 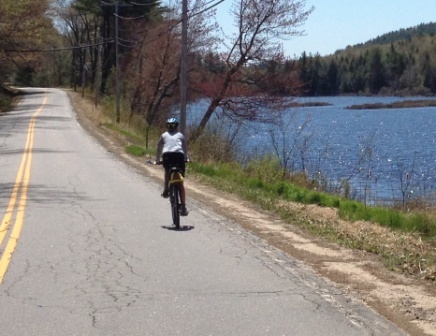 The Wolfeboro Inn is smack-dab in the center of bicycling heaven. Located in a coveted cove along mammoth Winnipesaukee Lake, it’s a perch offering sunsets from a private beach or from your deck. I got there in early afternoon and headed to the nearby Cotton Valley Trail. 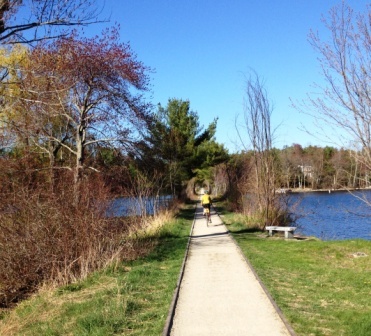 This 12-mile crushed-rock railroad trail stretches from Lake Winnipesaukee to the railroad turntable in Sanbornville. It meanders across three lakes, passes over many trestles and winds through pine forests, open fields and quiet marshland. Stop at Cotton Valley depot – a restored train station with picnic spots, bathrooms and parking – if you are not staying overnight. From Fernald Station, it’s an easy 6.5 miles one way from the depot to downtown Wolfeboro. Take a dip at Albee Beach and then zip back over the causeway for views of lake on all sides. You’ll deserve one of the 100 different varieties of beers in Wolfe’s Tavern back at the Wolfeboro Inn. With great pub fare at the bar and an organic/locally inspired restaurant menu, you’ll be content to while away the evening. Local bands often play in the fireside lounge. With covered bridges, tumbling waterfalls, wide-open meadows, white clapboard churches and explosions of autumn leaves, Jackson is heart-stoppingly beautiful – especially if you’re riding the back-country lanes and stopping occasionally to catch your breath. Starting at Christmas Farm Inn, where I’ll return for hot tubs, heated pool and dinner after a longer mountain ride, I park the car at my quaint stream-side cottage, Livery Stable. Biking straight down the driveway, I head toward Jackson Falls. From the bridge, make sure to stop for a long-range view of Iron and Tin mountains and Doublehead peaks, as the falls crash down to Wildcat Brook into Ellis River. This is the place for a dip after the loop up and over the hills. Find a hidden pool of mountain-cold water and jump right in! 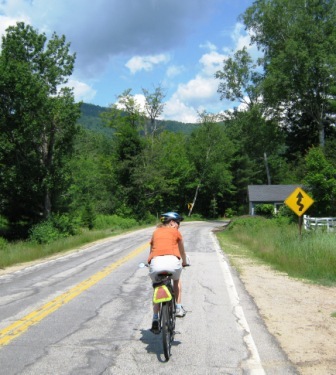 Carter Notch Road takes you past Eagle Mountain House and a wide expanse of golf course, meadow and stream. With limited traffic and Spruce Mountain hovering to your left, it’s two miles of autumn colors all to yourself. If you dare, continue up Carter Notch Road to Prospect Farm Road for a heart-pounding view from peaceful apple orchards and late-season gardens. After you catch your breath, zip down from Prospect Farm to 16B, or Five Mile Circuit, for a calm, rolling ride through pine forests and mountain vistas – no uphill required. Shovel Handle Pub, at the intersection of Black Mountain Road and Moody Farm Road, is a three-story post-and-beam barn with more than 10 microbrews on tap and pub fare perfect for sweaty bicycle riders. Then, it’s a quick downhill jaunt back to Jackson Village and its covered bridges. You decide if you’re up for a jump in the falls or a soak in the hot tub back at Christmas Farm Inn. I take a dip, then a soak, and call it a perfect day. – Parking my car at Loon Preservation Museum on Lees Pond in Moultonborough, I stop in to learn about all things loon before the bicycle ride over Red Hill to my destination at Rockywold-Deephaven Camps. Loons are solitary birds and come to quiet ponds and lakes of New England every spring. Squam Lake is known for families of nesting loons, and Rockywold-Deephaven Camps hosts resident loons every year. They especially come out during the fall, when the lakes calm from boat traffic. From Moultonborough, I find Sheridan Road, which takes me past a tiny rope-tow ski area called Ski Red Hill, and Garland Pond. There are late-season wildflowers and roadside farm stands with heirloom tomatoes – and most importantly, no cars. Red Hill looms on my left, but I bicycle along its edges until I hit Range Road and the paved ride becomes packed dirt. A huge boulder, called Great Rock, urges me to stop and climb. Even though I’m tempted to grab a sandwich in Sandwich, I decide to push on around Squam Lake via Millbridge Road. Squam Lake sits like a sapphire, still jewel as I follow its curves and coves. 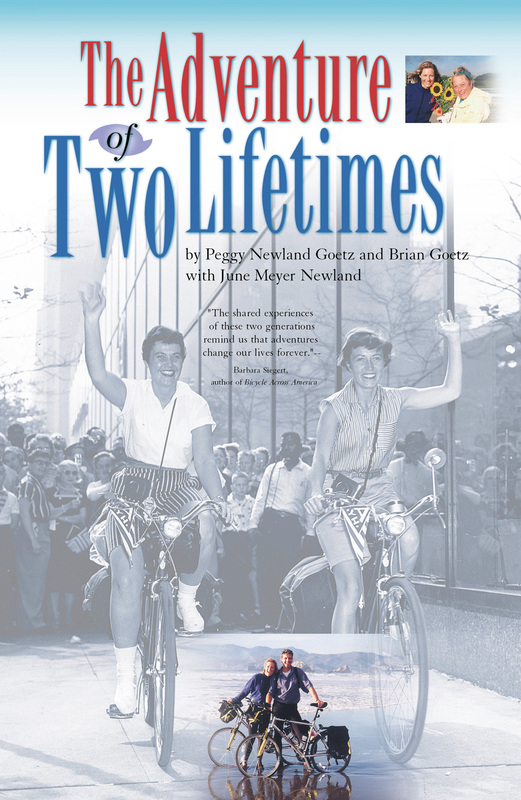 In 1956, June Meyer, and her friend, Teri Foster, rode 3-speed Schwinn bicycles from New York to California. They wore saddle shoes and Bermuda shorts and trained by “riding around the blocks of Brooklyn a couple of times.” They went, not to break records in speed or distance, but for “the adventure.” David Garroway of the Today Show interviewed them from Rockefeller Center and since their saddle bags were overstuffed, June remembers almost crashing into the photographers taking their pictures. What followed were 90 days of adventure and misadventure. Upon reaching California, she went on a blind date. The biketrip forever changed her life, but her blind date changed it even more. Forty years after that epic trip, June’s daughter, Peggy Goetz and Peggy’s husband Brian followed that same east to west 3,000-mile cross-country bike route. This time, they had 24-speed Schwinns, wore hi-tech polypropylene outfits and had clipless pedals. Bryant Gumbel interviewed them on the Today Show as they started out from New York City. Following June’s 1956 path, she and Brian bicycled through the Pocono Mountains of upstate New York, across the north coast of Lake Erie in Ontario, through the corn, wheat and soybean fields of Ohio, Indiana, and Illinois, over the rolling hills of Iowa and Nebraska, the 12,000 foot Continental Divide in Colorado, the wondrous beauty of southern Utah’s canyon-country, across Nevada, into Yosemite National Park and finally, dipping our front tires in the Pacific Ocean in San Francisco. In their book, The Adventure of Two Lifetimes, Peggy and Brian interweave their trip with her mother’s. While they tell their story from the road, June is back in Virginia Beach, keeping in touch with them by phone and re-constructing her 1956 trip from her detailed journal, her memoirs, an extensive scrapbook, and photographs. In the same vein as William Least Heat-Moon’s Blue Highways, The Adventure of Two Lifetimes takes a few “sidetrips”. It tells of an America that has changed, yet has remained the same, over 40 years. How booming towns of the 50’s have become modern day ghost towns due to the “bypassing” interstates. How friendly people from both the 90’s and the 50’s opened their houses to weary travelers and shared their stories to our own. How June’s idealistic naiveté of the 50’s almost got her raped in Las Vegas and how Peggy and Brian’s pessimistic attitudes of the 90’s occasionally held them back in fear. How the quiet of farmland, the vastness of deserts and snow-capped mountain peaks, the smiles of strangers, and the power and freedom of riding on the road, made realizing individual dreams worth all the effort. The Adventure of Two Lifetimes is not a travelogue, of daily mileages in linear directions — its a memoir to time, of places, of a mother’s story, and her daughter’s. It’s a book about taking what you already have and journeying to places unknown, inside and around. How the process of doing becomes the process of being. How one woman’s courage and quest for a place in the world forever changed her life. And how her daughter, after years of living in the shadow of that great feat, found a place of her own, together, with her husband.